In a sign that many consumers use gift cards to purchase everyday household items, big box retailers continue to lead loyalty points and rewards redemptions in the U.S., according to a new study from the National Gift Card Corp. (NGC). 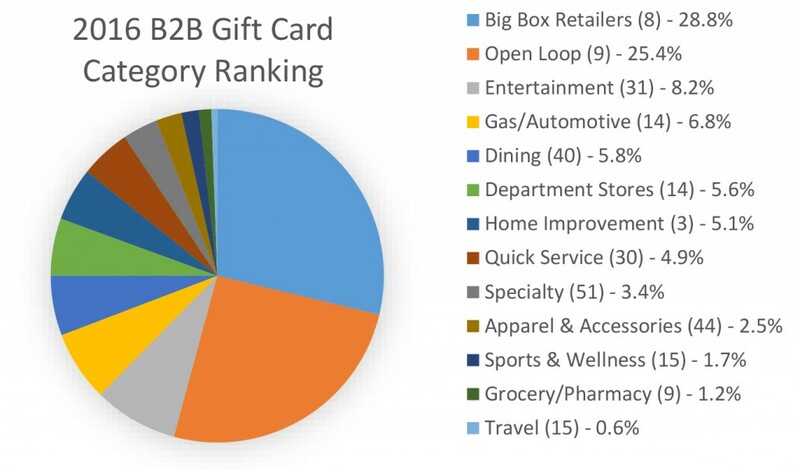 The B2B gift card solutions provider’s latest gift card report analyzed redemptions for U.S.-based loyalty, reward and employee programs that offered gift cards in 2016. Among the study’s key findings were that 28.8 percent of total gift redemption volume was comprised of just eight big box stores, including Walmart, Target, Home Depot, Kohl’s and Lowe’s. The big box retail category took the top spot on the list for the second year in a row. Meanwhile, open-loop prepaid reward cards from Visa, Mastercard and American Express accounted for 25 percent of B2B incentive rewards volume. Meanwhile, the report also found that—despite the steady rise of digital gifting—plastic gift cards continue to comprise the vast majority of redemptions among programs included in the study, with 85 percent of the volume of gift card redemption occurring via plastic cards, compared with 15 percent for digital gift cards. Along with big box stores, the most popular physical gift cards redeemed were for Starbucks, iTunes and Applebee’s, as well as various gas cards. While most millennials tend to prefer digital gifts, there’s still “a substantial population” of gen X and baby boomers who prefer physical gift cards, observed Thiegs. “There’s also some digital backlash as end users experience e-card technology issues, training gaps at the point of sale, confusion with mobile wallets or even fraud,” he added. While digital gifting will continue to grow, physical gift cards “will continue to be perceived by many to be the safest and most universal option for years,” Thiegs said. It may come as no surprise that the CFPB’s latest monthly complaint snapshot released Oct. 25 focuses on complaints related to prepaid products, considering the agency released its long-awaited final prepaid accounts rule earlier this month. But despite the bureau’s contention that “the report shows that consumers continue to experience issues trying to manage their accounts and access funds,” prepaid-related complaints to the bureau dropped 21 percent in September.